[S13428] 1921 Canada Census, Charlottetown, Queens County, Prince Edward Island, household of Russell McKinnon, digital copy of original document Library & Archives Canada, Ottawa; Census Place: Charlottetown, Queens County, Prince Edward Island; Page 18, Library & Archives Canada, 395 Wellington St., Ottawa, Ontario, Canada, Library & Archives Canada. [S13424] 1891 Canada Census, Lot 25, Prince County, Prince Edward Island, of Allan McKinnon household #25, 8 April 1891, digital copy of original document Library & Archives Canada, Ottawa; Census Place: Lot 25, Prince County, Prince Edward Island; Microfilm reel T-6382; Page 6, Library & Archives Canada, 395 Wellington St., Ottawa, Ontario, Canada, Library & Archives Canada. [S13425] 1901 Canada Census, Summerside, Prince County, Prince Edward Island, of Allan McKinnon household #12, digital copy of original document Library & Archives Canada, Ottawa; Census Place: Summerside, Prince County, Prince Edward Island; Microfilm reels T-6428 to T-6556; Page 2, Library & Archives Canada, 395 Wellington St., Ottawa, Ontario, Canada, Library & Archives Canada. [S13427] 1911 Canada Census, Charlottetown, Queens County, Prince Edward Island, of Russell McKinnon household #13, digital copy of original document Library & Archives Canada, Ottawa; Census Place: Charlottetown, Queens County, Prince Edward Island; Microfilm reels T-20326 to T-20460, Page 2, Library & Archives Canada, 395 Wellington St., Ottawa, Ontario, Canada, Library & Archives Canada. [S2068] Marlene Hitchcock, , Marlene Hitchcock (Aylmer, Québec), downloaded 7 July 2003. [S1067] Allan Lee Tieman, "Allan Lee Tieman, compiled records" (Blue Island, Illinois). . Hereinafter cited as "Allan Lee Tieman, compiled records." [S2043] Cory Family Society. This site contains genealogies of several early Corey/Cory families., online http://www.coryfamsoc.com. Hereinafter cited as Cory Family Society. [S6810] 1901 Canada Census - Winnipeg, Manitoba, household of Clarence Bradshaw, 1901, digital image Page 19, Family #162, Library & Archives Canada, Library & Archives Canada, 395 Wellington St., Ottawa, Ontario, Canada, Library & Archives Canada. [S2354] Fulton Underhay, online http://www.islandregister.com. (PEI), downloaded May 2006. [S11404] Certificate of Registration of Marriage, William Alexander Riggs McGaw & Helen Adelaide Lamb marriage, 10 December 1938, Church of Latter Day Saints, www.familysearch.org, Salt Lake City, Utah, U.S.A.. British Columbia Marriage Registrations, 1859-1932, 1937-1938, Reference ID: Registration 5819; Digital Folder Number: 101348640; Image Number: 02791. 1901 Canada Census, Winnipeg, Manitoba. Household of Clarence Bradshaw, his wife Ruth, their daughter Kathryn, and his sister Kathryn. 1911 Canada Census, Victoria, British Columbia. Household of Clarence Bradshaw, his wife Ruth, their daughters Catherine & Alexandra, and a domestic. [S5813] Correspondence with George Read . Personal Archives of David Arthur Walker (Edwards, Ontario, Canada). [S6811] 1911 Canada Census - Victoria, British Columbia, household of Clarence Bradshaw, 1911, digital image Page 10, Family #108, Library & Archives Canada, Library & Archives Canada, 395 Wellington St., Ottawa, Ontario, Canada, Library & Archives Canada. [S10117] Marriage Registration, William LeRoy Cannon & Mary Stoddart McLarty marriage, 16 October 1913, Church of Latter Day Saints, www.familysearch.org, Salt Lake City, Utah, U.S.A.. British Columbia Marriage Registrations, 1859-1932, LDS GS Film Number 1983527, Digital Folder Number 004400854, Image Number 02901, Reference ID 13 09 026099. [S10118] 1921 Canada Census of South Vancouver, British Columbia, of William Leroy Cannon household #190, 1921, Microfilm image LAC Reference Number RG 31, Folder Number 19, Page 17, Library & Archives Canada, 395 Wellington St., Ottawa, Ontario, Canada, Library & Archives Canada. Marriage Registration, William Leroy Cannon & Mary Stoddart McLarty, 16 October 1913. Death Registration, George Edward Cannon (1929-1949). [S1345] Preserving the Wallace Family 1758-1988, Roy Ashley Wallace, compiler, (Prince Edward Island, Canada: Privately published, after 1988), p. 155. 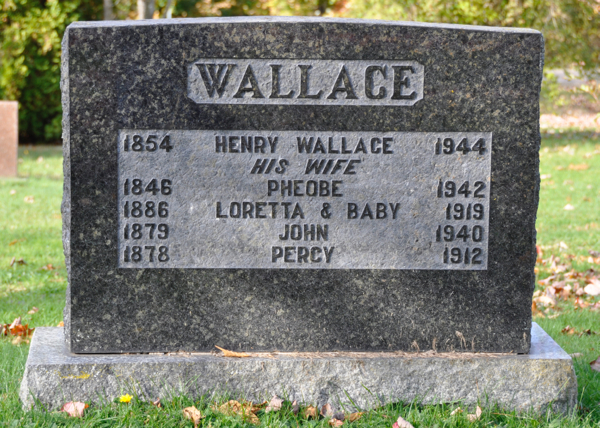 Hereinafter cited as Preserving the Wallace Family 1758-1988. [S10120] British Columbia Death Registrations, 1872-1986, digital image of original page British Columbia Archives film number B13201, Division of Vital Statistics, Registration Number 49 09 006118, FHL microfilm 2,032,571, Digital Folder Number 004438071, Image Number 01142 (filed 20 June 1949), Church of Latter Day Saints, www.familysearch.org, Salt Lake City, Utah, U.S.A.. Hereinafter cited as Death Registration. [S1014] Wayne Gunter, "Gunter Family Heritage File" (Fredericton, New Brunswick, Canada). . Hereinafter cited as "Gunter Family Heritage File." [S966] Marjorie (Molly) Jansen, "Compiled Records - The Family of Big Jim McLaughlin". Unknown comments. Hereinafter cited as "Compiled Records - The Family of Big Jim McLaughlin." [S8829] Al MacNutt & M. (MacNutt) Wilford, "The Descendants of James (Jamey) MacNutt" (http://www.islandregister.com/mcnutt1.html). . Hereinafter cited as "Descendants of James MacNutt." Burial* Baby McLaughlin was buried in Greenwood Cemetery, Shediac, Westmorland County, New Brunswick, Canada, 46.22710,-64.51672 . [S7648] Cemetery marker, Greenwood Cemetery, Shediac, New Brunswick, Henry Wallace family plot marker transcription; read by David Walker. 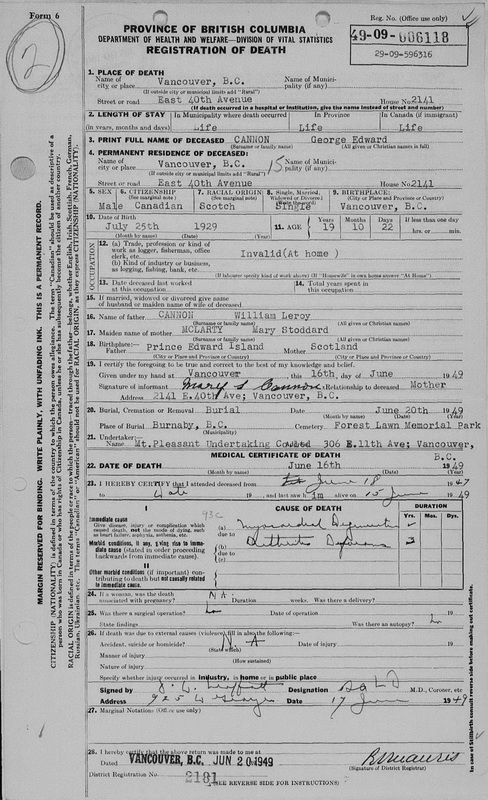 [S7724] Death Registration, Westmorland County, Charles McLaughlin entry, , Provincial Archives of New Brunswick, Fredericton, York County, New Brunswick, Canada. Hereinafter cited as Death Registration. [S7671] Pat Allan, Family records, Personal files. [S2354] Fulton Underhay, online http://www.islandregister.com. (PEI), downloaded May 2006, Page 28. 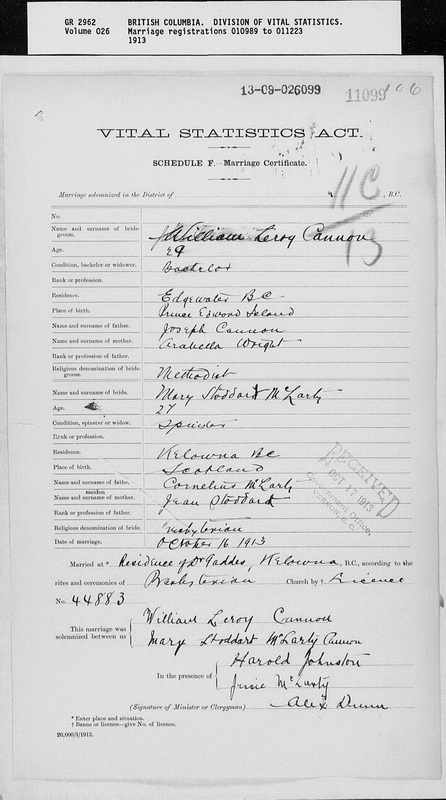 [S13587] Baptismal record, Mary Ameliana McLaughlin,, St. Andrews Roman Catholic Church Records, St. Andrews, Queens County, Prince Edward Island, Canada; Record Book Number 1; Record Book Page 103, (7 February 1871). Hereinafter cited as Baptismal record.